Goscor Earth Moving (GEM), the official distributor of SANY, the fifth-largest construction and related equipment manufacturer in the world, will showcase its front-end loader and excavator range at Grain SA’s NAMPO Harvest Day from 14 to 17 May in Bothaville in the Free State. With the agricultural sector representing a potential growth area for the brand in Africa, NAMPO 2019 is the ideal opportunity to have the farming community get up close and personal with the SANY range, according to Murray Leith, who heads up SANY Operations at GEM. The SYL 956H1 front-end loader will take centre stage at the Goscor Group stand at NAMPO 2019. This machine is built tough, with a bucket capacity from 3 m3 to 4.6 m3 to ensure it is well-suited for the agricultural sector. The highly-efficient drive system features a rotary automatic gearbox that boosts travel speed by 10%, and increases towing force by over 6%. The rated load is 5 000 kg, rated power is 164 kW, and the break-out force is 175 kN. The positive flow hydraulic system has also reduced fuel consumption by 10%, due to advanced dynamic control technology providing a real-time match between engine power and main pump power. Fuel economy is optimised further by means of four power modes for added flexibility. Part of the Goscor Group, GEM offers SANY excavators, front-end loaders, motor graders and rollers for the construction, mining, agriculture, sand and stone, forestry, roadworks, and plant-hire sectors. With its primary focus on the mining industry in Africa at the moment, agriculture is nevertheless an important market that GEM is focusing its attention on. At NAMPO 2018, it showcased a range of SANY compact equipment that is ideal for agricultural applications, with great success. The penetration into such diverse markets also represents GEM’s ongoing investment in the SANY brand, which is quickly gaining a major footprint in Africa. “The advantage of SANY for our agricultural customers is not only highly competitive pricing in the industry, but also the best return on your investment with technology that has been adapted especially for arduous African operating conditions. In addition, our association with the Goscor Group means that not only do we have an extensive branch network, but can offer superlative customer service and technical back-up,” Leith concludes. 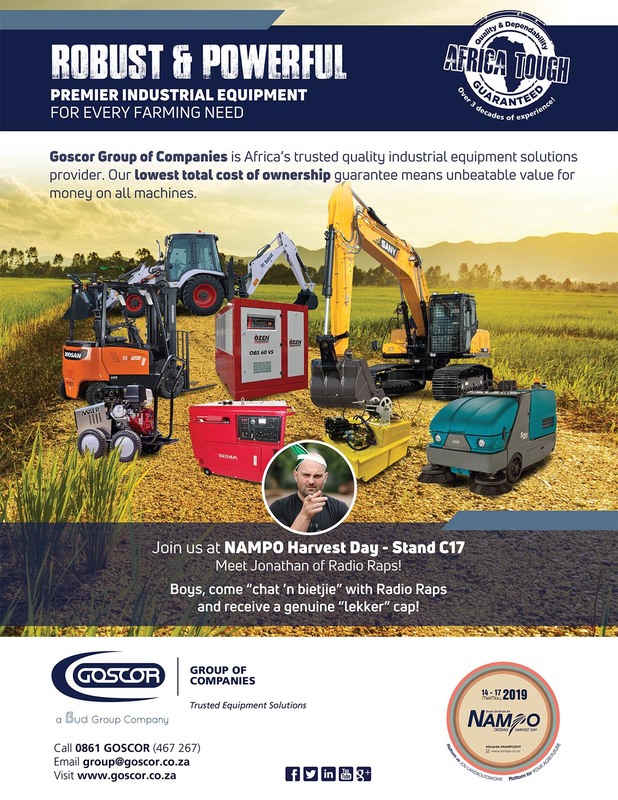 Visit Goscor Earth Moving (GEM), part of the Goscor Group, and official SANY distributor, at Stand C17 at NAMPO 2019. For more information go to www.grainsa.co.za/pages/nampo/nampo-home.